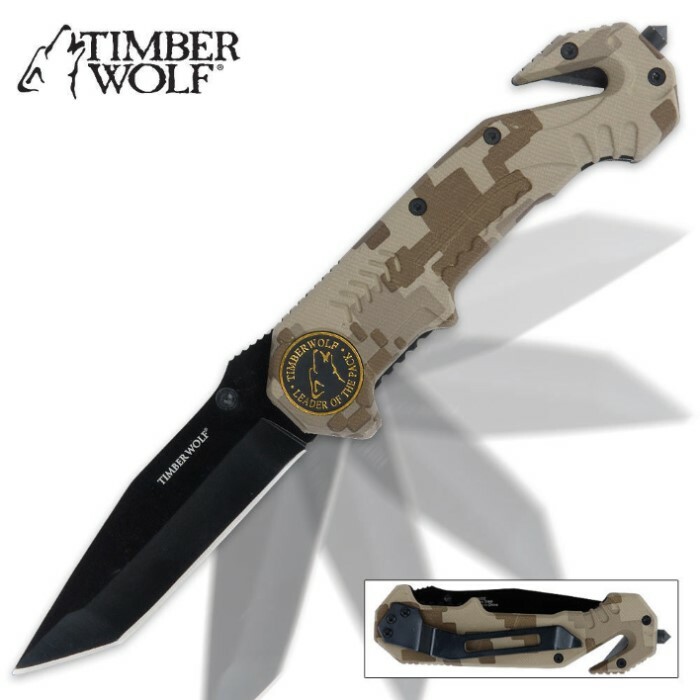 Timber Wolf Assist Rescue Camo Folding Knife | BUDK.com - Knives & Swords At The Lowest Prices! 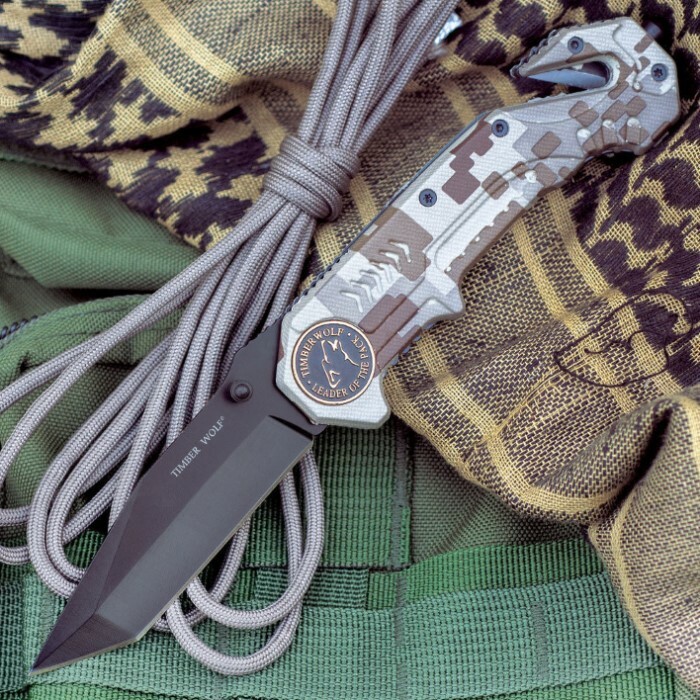 Tired of paying big money for an assisted-open pocket knife? 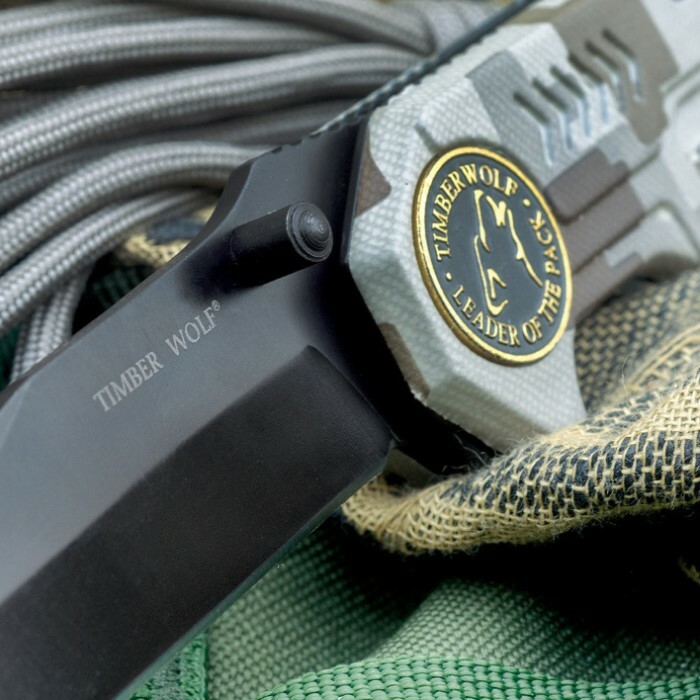 Well, we've got you covered with Timber Wolf's Assisted-Open rescue pocket knife! It's great for first responders to have in their vehicle, as it's equipped with a pocket clip, glass break spike and seat belt cutter. I got this for my birthday and it is a great knife for everyday use. It's light, sharp, good looking, has a removable pocket clip, and has a good grip on the handle and mine came pretty sharp right out of the box. One of my favorite knives I've ever owned. Works good. opens fast.It has a good weight and nice size for all around use/. I asked for this for Christmas. I opened it and was already disappointed. It is made of plastic and the tip broke off immediately! I don't recommend this piece of crap to anyone. A good value for the price paid and for emergency or infrequent uses, such as fishing or camping. I bought 4 - one for each car and 1 each for each emergency pack. I may buy more for gifts. It is heavier than I thought it would be, the blade seems sturdy and the seat belt cutting and glass-breaking features are pluses. A nice utility knife to leave in the Jeep especially if glass breakage is needed to escape. A thick handle and a sharp blade. The assisted opening blade is a selling point but not essential. Buy one-get one for $12.99 or individually for $7.00-comes out about the same. Great knife. especially for the price. I would would definitely recommend this knife. It's not the best knife out there but it definitely meats its standards. This knife is very, very great. Why? First, the design is eye-catching without being flashy. Secondly the grip is comfortable and firm, it will not slip. Third, the assisted open may be a little tricky at times to find the right angle, but 9/10 times you'll be surprised how effortlessly you can open it in a split second. Fourth the blade is designed to be great for slicing, stabbing, and sharpening. Finally the belt-cutter works well for cords and string, not just seat belts. Overall this knife is a steal for only $7 because IMO it's worth much more. You won't be disappointed. This knife is going to be a great aid to me in the future... The assisted open is only so-so (hence the 4 stars and not 5) and could use some sharpening but that's no big deal. the pocket clip, liner lock, handle, and blade are all solid pieces of construction with little to no blade play. Seatbelt cutter works beautifully and that glass break spike looks mean. Great knife overall!